Painting exterior brick can be a simple way to give your home a fresh, on-trend look. There are many reasons why homeowners opt to paint brick houses, but is it ever a good idea to paint brick? While it may be a practical solution for some, there are pros and cons to painting exterior brick that you should keep in mind before moving forward with your exterior painting project. If your home has an outdated red, orange, or yellowed brick exterior, a paint refresh can provide many advantages. Boosts curb appeal. Painting brick is a great way to upgrade curb appeal and increase your home’s value. Using a dark color like slate grey or even a classic white can create a major visual impact when painted correctly. Provides protection from the elements. When your brick house is properly updated with new paint, the paint will act a sealant to protect your home from precipitation and other seasonal weather changes. Paint can also help reduce fading and deterioration of your home exterior. Easy to keep clean. Brick is naturally porous, so when left unpainted, dirt and debris can become trapped and difficult to clear away. Painted brick provides a smooth surface that is much easier to clean with occasional power washing. Painting exterior brick can certainly be beneficial, but it’s also a task that comes with some important considerations. Painted brick is permanent. After you paint your brick house, you can’t go back to its original brick exterior. Professional painters know that once brick is painted, it needs to stay painted. And the process of even trying to remove paint from brick can be very costly. The good news is that you can change the paint color as often as you’d like, so you don’t have to be married to one hue forever. Moisture can cause paint to chip. This is true for many home exteriors, but excess moisture can be a valid concern with painted brick especially near the ground. Simple repaints every 7-10 years can help prevent this, however. Occasional repaints will also keep your exterior brick looking fresh at all times. You may need to clean your house exterior more often. While painted brick is easier to clean than a natural brick exterior, dirt and mildew are much more visible on painted exteriors. Opting for an occasional professional power washing can keep your brick exterior crisp and clean. This service is very affordable and typically only costs a few hundred dollars. Brick is a building material that is chosen for its already built-in color and durability. Homes that are made of brick are typically crafted so that a homeowner will never have to paint the masonry. This doesn’t mean that you have to shy away from painting brick. Following these tips will ensure your home is painted properly and looks exactly as you’ve envisioned. Never paint molded, deteriorating, or chipped brick. Many homeowners think a new coat of paint will help hide molding or deteriorating brick. This notion couldn’t be further from the truth! Damaged bricks should never be painted as they are susceptible to moisture. When moist bricks are painted, you will only exaggerate the problems you’re already experiencing. Use the correct paint. Because brick exteriors are extremely porous, you will need to select a high-quality masonry paint (and possibly primer) to ensure successful, lasting results. Making an appointment for an in-home professional paint color consultation is essential for choosing the right primers and paints. Hire professional exterior painters. If you decide to paint over damaged brick, fail to properly prepare brick for painting, or use the wrong paint, you’re in for a real mess. Expert painters know exactly which tools, paints, and materials to use so that your brick is adequately repaired, cleaned, dried, prepped, and painted to the highest of standards. Consider smaller, less permanent exterior changes. If you are still on the fence about painting your exterior brick, don’t just go for it without thinking it through. Again, painting brick is permanent, so you need to be absolutely sure that this is something you definitely want to do. You can always choose to freshen up your home exterior in other ways. Before taking the plunge, consider exterior wood trim painting, garage door painting, or painting your shutters and windows. All of these things can help upgrade the look of your entire home. 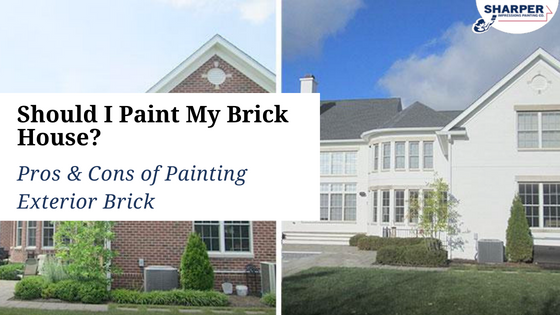 Painting brick is a relatively simple way to create a major visual impact and increase your home’s curb appeal. While there may be some minor drawbacks to painting brick, professional exterior painters can ensure that your brick home is painted properly and looks great for years to come. Skilled house painters utilize only the best paints and finishes to give you a flawless paint job that guarantees a stress-free home improvement experience. Get your free exterior painting quote today!